For as long as there has been recorded information libraries, librarians and educators have been “sharing content, collaborating with others and creating community” (De Rosa, Cantrell, Havens, Hawk, & Jenkins, 2007, p.2-1). In the information age the explosion of tools available for connecting, creating, conversing, and collaborating, and the changing habits and expectations of the community means that social networking is increasingly part of the role of librarians. 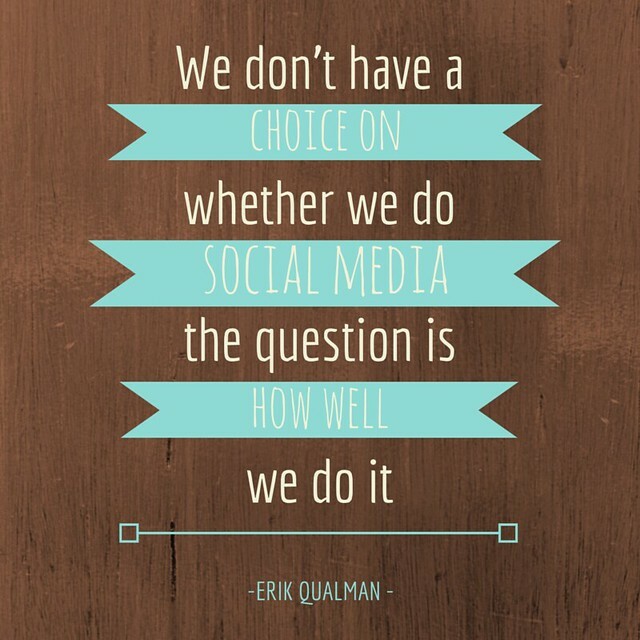 As Qualman tells us: “We don’t have a choice on whether we do social media, the question is how well we do it” (The Social Media Revolution 2015, 2011). Library 2.0 marks a transformation in the way libraries provide services to their community and in particular, participatory library services enabled by Web 2.0 technologies. A library without a website is now almost unimaginable. The ubiquity of social networking means that a library without a social media presence is fast becoming just as unimaginable. More and more internet access happens via mobile technologies, a “fast” trend according to the latest Horizon report (Johnson, Adams Becker, Estrada,& Freeman, 2014), and participation in social media is increasing. Libraries attempting to meet the information needs of their users must also be involved. “In order to remain relevant in the current landscape of information discovery libraries must have multiple presences on the web to engage users wherever they prefer, including social media…” (Horizon report p.26). The three libraries examined in Why should libraries be on social media? (Bailie, 2015, January 29) use a range of social networking tools to connect and share with their users, Facebook pages and Twitter being common to all three. Two of the libraries share longer items on blogs. Blogs are an ideal format for publishing articles about library services, resources, events and news (Wallis, O’Connell & Liu, 2014a). Users can connect to these articles through an RSS feed (Wallis, O’Connell & Liu, 2014b) provided on the library website or via links provided on Twitter and Facebook. They then have the option to engage further by responding or asking a question on Twitter or Facebook or by commenting directly on the blog. Schrier (2011) urges libraries to use their social media presence to listen to their users, to provide value by engaging in discussion, and develop trust by responding to questions and being transparent in response to criticism or complaints. @hbailie Thanks for the thoughtful review. Let us know if you’d like more info on the Library Minute production process. Just as in good website design, where multiple access points for contact are essential (Bartlett, 2014), social media gives library users additional ways to access and interact with library staff. For many people the option to ask a question whenever and wherever they are, using their phone to tweet or post to a Facebook page is more appealing, accessible and likely to happen. King (2015) suggests that social media allows librarians to take a more conversational tone to enhance connection. Where a website will use formal language and style, social media posts typed “like you talk” (p.18) resonate with users and lead to increased engagement, as does asking questions instead of just posting links. As Seth Godin says “Marketing is no longer about the stuff you make but about the stories you tell” (quoted in Souza, 2014). It is vital that whoever is operates an account representing an organisation is very clear about what is acceptable content and that this is explicit in the organisation’s social media policy. Articles examining such issues were curated in the post Social media policy (Bailie, 2015, January 15). Initiating conversations and developing guidelines about the use of social media are important for all who work in education and libraries (Nielsen, 2014). Schools operate under different restrictions to public or academic libraries but simply banning or blocking social media is not in the best interests of the development of good digital citizens (Lupton, 2013). Policies can be developed to allow participation while protecting the vulnerable (Anderson, 2013; Nielsen). Used well, social media is an empowering educational tool (Harris & Cusick, 2014; Nielsen), and not just for students. Holmes, Preston, Shaw and Buchanan (2013) found social media, specifically Twitter, to be valuable for professional learning by educators through access to new resources and the support of like-minded others. Connecting with users wherever they are is key to maintaining the relevance of the library’s services. It is no longer enough to wait for users to walk through the library door before offering a service. Social media allows individuals to form communities, collaborate, converse and create content. A library cannot afford to be merely a physical space with analog resources available for individual use. By leveraging social networking technologies the library becomes a 24/7 anywhere, any time operation. I have approached this subject from multiple perspectives. As a librarian, as a teacher and as a teacher-librarian. I am interested in social networking’s place in libraries in general and in school libraries in particular – there are important differences in what that means due to the age of students and the obligations of “duty of care”. I recognise that public and academic libraries must also have policy and guidelines around social media use but these are less restrictive than for those of us working with young people. Nevertheless I am very interested in the place and use of social networking in the education of primary and secondary students and where the school library fits in. Unlike some others in this cohort I came into this subject with a long and broad experience of using social media as a personal learning network where I connect, converse and collaborate with others around issues in education, technology and libraries. Other than Second Life which I had heard of but not used, none of the social networking tools were new to me and I was already an extensive user of several. The biggest change in my social networking habits over the course of INF506 has been in my use of Facebook. Previously my Facebook use was almost exclusively for personal reasons – Facebook is where I connect with friends and relatives, people I knew before Facebook. With the subject’s main home being Facebook I found myself checking it several times a day instead my usual few times weekly. I started to explore a bit more and for the first time I have deliberately sought out pages to “like” that relate to my professional rather than personal interests and I am enjoying a more diverse newsfeed because of it. Exploring Second Life was interesting and I’m glad I’ve done it but I don’t think I will pursue it further. I understand why a university might like to give distance students the opportunity to “sit” in a classroom and participate in a virtual class but it seems a shame to just recreate an on-campus experience when there is technology available for new and varied online learning experiences that aren’t feasible in a traditional, physical classroom. Second Life is a bandwidth hog and managing your avatar is a challenge – to me it is easier to have a discussion using Google Hangouts; explore actual museum and gallery collections from sites like The Metropolitan Museum of Art or Europeana, or go on a virtual field trip. Why recreate real places in a virtual world when you can explore the real thing using technology like Google Street View? Prior to this subject if I’d thought about public and academic libraries’ use of social media I would have said that they use it to broadcast information rather than converse and connect with their users, even though my personal use is all about connections and conversations. Through reading for this subject and subsequent activities evaluating library websites and library use of social media I’ve started considering the impact and implications that a conversational, participatory approach has for organisations. It was a little disappointing to find that, for the libraries I’ve observed, the communication is in fact mostly one way. King’s (2015) reasons for libraries using social media include listening, connecting and responding. As I move forward with social media in my workplace I will be very aware of the importance of cultivating a collaborative two-way communicative approach rather than simply developing a broadcast medium, although that is more of a challenge in a school. My workplace, a K-12 independent school, is only at the very beginning of social media adoption – for example the setting up of a blog for year 6 students last year was a very big deal. For most of our students having their own social media profile is not an option as they are aged under 13 so we would not consider having a library Facebook page unless it was exclusively promoted to senior students. However I think there would be support for class and library Twitter accounts, managed by a teacher or me, that could be used to interact with an author or expert, or to crowd-source information or similar (Harris & Cusick, 2014). Our Twitter feed could also be featured on our library website which we are just starting to develop using LibGuides so we could use it to broadcast and connect outside the school but not directly with our students. An unexpected bonus of this subject was what I learned from exploring effective library website design which will be applied to our LibGuides development. and there’s just enough daggy humour to make you smile. They would be well-received by today’s university students who, like millions of other young (and not so young) people have made YouTube the second top search engine. I imagine these videos, along with the other social media tools used by the library, help break-down communication barriers by making the library staff approachable and available in multiple ways both online and in real life. The ASU twitter stream includes study tips, timely information about extended hours, competitions and special events. Their Facebook page includes lots of eye-catching visuals with similar information to the Twitter stream in longer, less frequent posts. I am seriously impressed by the videos and I wonder how many man-hours go into making each one? The technological side would be relatively easy, even just with an iPad you can green screen (Green Screen by Do Ink), edit (iMovie), add effects and so on; but before they got to that stage someone (or several people) have spent serious time writing the script and story-boarding. They are evidence of a strong collaborative process and co-ordinated marketing plan. I would love to create similar videos for my library even though I don’t have the same level of resources behind me. On a final note, this video, highlighting ways to have fun at the library is one of my favourites. Who wouldn’t want to connect with a library like that! Social networking is the use of online tools to connect, communicate, share and collaborate with other people. Social networking can be used for purely social reasons or for education or work. Social networking enables people with common interests to connect in ways unthinkable before the birth of the world wide web and particularly the development of participatory web 2.0 tools which allow an individual to publish their writing, photographs, videos and so on. I am proud to be Twitter user no.16,589,509 having joined in October 2008. At that point I already feared I was a late-adopter! Twitter is the heart of my PLN and is invaluable for my work in a school library, my interests in education and technology, and was a key driver for the connections I’ve developed with my fellow MEd (Knowledge Networks and Digital Innovation) students. That said, I also follow various accounts for news purposes and quite a few people/accounts just for their entertainment value. Last year I set up and used a Twitter account for the Disaster Resilience Education project I worked on at Australian Red Cross and at my previous school I set up an account mainly to follow accounts to generate a Paperli daily news edition. I use Facebook mostly for personal and social connections, all my Facebook friends are people I knew in real life before we became Facebook friends. In contrast in my early days on Twitter there were very few people I followed who I’d actually met. One of the great joys of Twitter though, is how wonderful it is when I actually get to meet one of my “old friends” and I’m happy to say that I now know many of the people I follow on Twitter and we were able to connect in real life because of the Twitter connection. I belong to a few Facebook groups that are education/library/technology focused but I’ve not been an active user of them (until now with the INF506 group). I’ve been using Google+ more and more of late, particularly since my experience at the Google Teacher Academy in September. I like the way the communities work and how everything integrates really well with other Google tools like calendar and hangouts. I’ve used Diigo for bookmarking for a long time and before that I used Delicious. I don’t regard it as “social” in the way Twitter and Facebook are but I belong to a number of groups and have also created groups for work purposes. Over the years I have belonged and contributed to a number of Ning networks and at my previous school I set up and managed a Ning network for our year 12 students and their teachers. Through studying this subject I hope to gain a more informed basis on which to draw on in order to advocate for the use of social networking within my library and school. Like many schools, mine is protective and wary of social media, particularly regarding the participation of students. I would like to develop my knowledge of the research about best practice in this field in order to make informed contributions to decision-making processes.